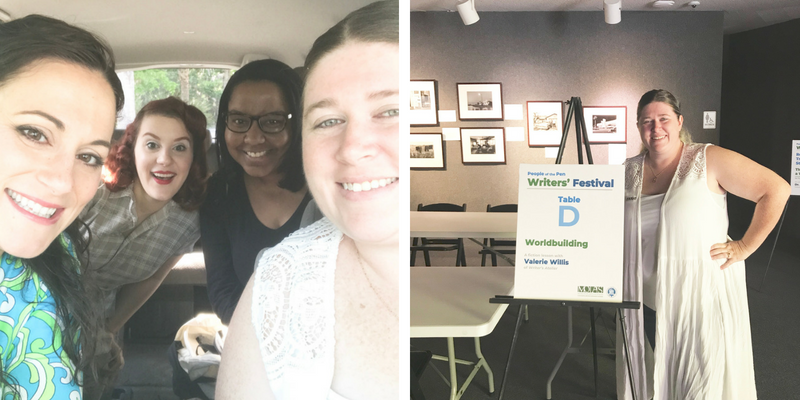 The Writer’s Atelier team was invited to participate in The People of the Pen Conference, hosted by Daytona State College’s writing club. The event was held at the Museum of Arts and Sciences in Daytona, Florida. 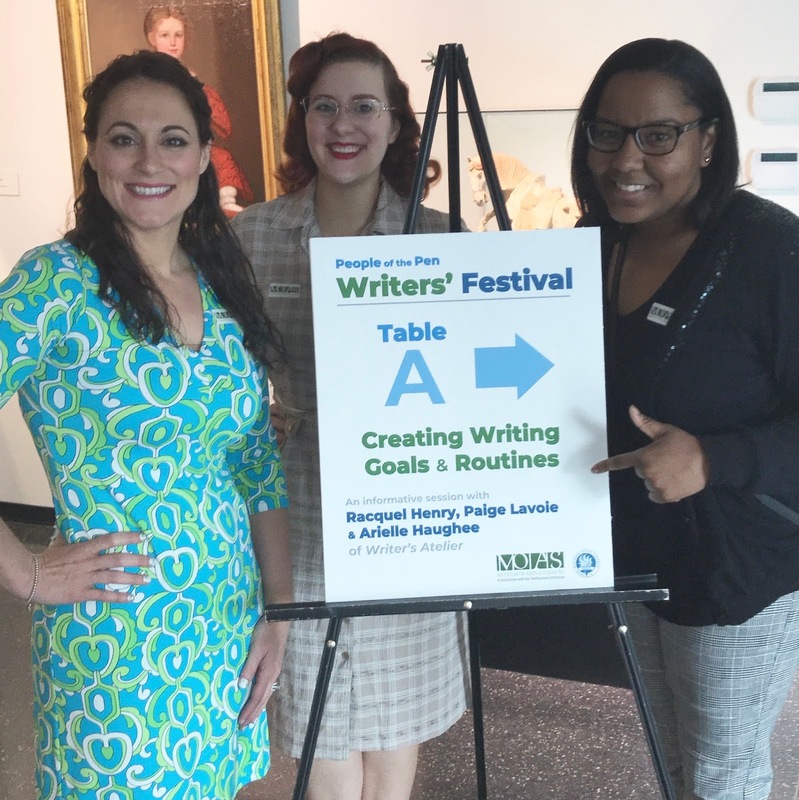 I was happy to teach a workshop titled, “Creating Writing Goals and Routines” alongside Arielle Haughee and Paige Lavoie. Valerie Willis taught an excellent workshop on Worldbuilding. The best part about these events is interacting with writers. 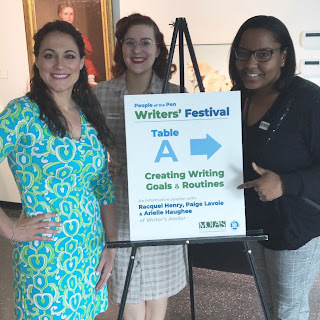 I love connecting with writers who are eager to learn the craft and enhance their writing lives overall. Plus, the venue was pretty cool. We spent some time wandering around the museum beforehand, which also doubled as a unique source of inspiration. 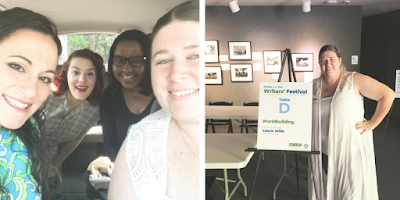 Overall, it was a great event and I got to do it with my writing friends! I’ve been meaning to write about it, but I’m doing a thing. My dear friend, Amy Christine Parker created an apprenticeship where she will study and practice the craft of writing. 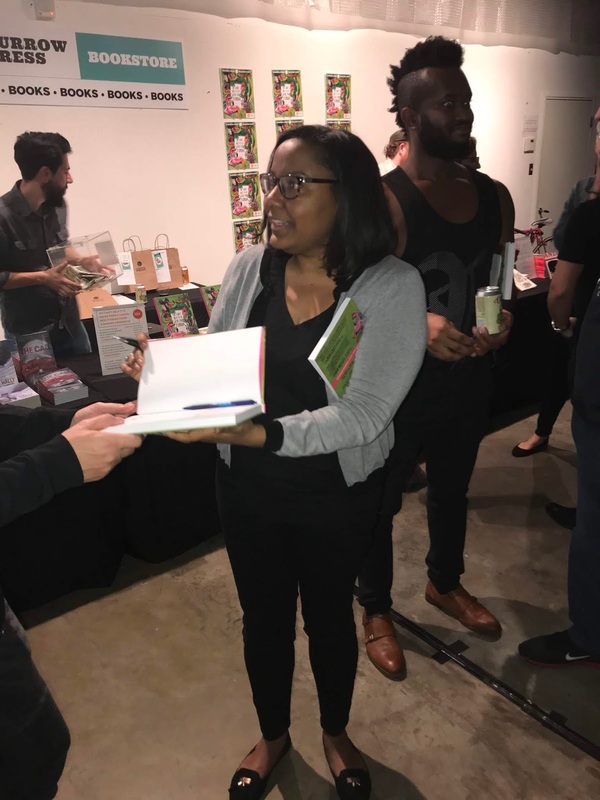 Every month she engages in writing activities like studying New York Times Bestsellers (especially those within her genre), reads craft books, outlines a novel, brainstorms ideas for a novel, and adds a thousand words each day to a current work in progress. She would love it if other writers created their own versions and joined in on the fun. 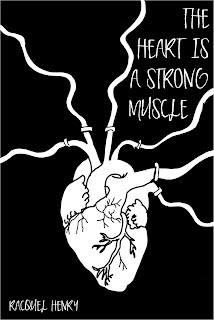 Find out more about Amy's apprenticeship here: www.amychristineparker.com. When Amy first told me about the idea, I was immediately intrigued. She made the point that “apprenticeships” had gone out of style, but the greats like Michelangelo and Leonardo da Vinci—that’s what they did. She was onto something there. And I had decided since I lost NaNoWriMo last year for the first time (still mourning that loss), I needed to figure out a way to make my writing a priority. What better way than to participate in Amy’s apprenticeship? I was in. The only small snafu was that I knew Amy’s version was not going to fit my lifestyle. I teach anywhere from 3-5 classes at a local college, run a writing studio, run a literary magazine, freelance edit, and I ghostwrite romance novels. Where on earth was I going to find that kind of time? I decided that I could do the apprenticeship, but on my terms. I thought about what kind of word count was realistic for me. For me, a thousand words sounded intimidating. I could, however, handle four hundred. Plus, I could knock out four hundred words a day in about thirty minutes if I focused. If I was going to get serious about my writing, then four hundred words per day for 30-40 minutes shouldn’t be too much to ask. Then I decided that I was going to make Fridays my apprenticeship day. So, for most of the day (between the hours of 10-3), all I do is work on personal writing. I also decided that I was going to read at least 2 books per month, one should preferably be a craft book. So how did I do for January? I completed reading 4 books, though one of those was not a craft book, and I wrote 15,905 words! Plus, out of the words I wrote, I ended up finishing my Nano novel and finishing this mini book idea I had been working on for Writer’s Atelier since last year. If I don’t do anything else, I really want to stick to writing every day. None of the other goals are as important to me. One thing that has already come out of this is the resurfacing of my love for writing. Writing had become very laborious and less fun. 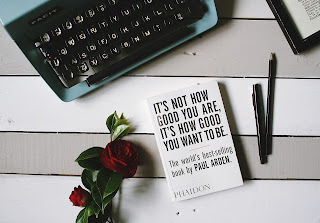 I felt like I always had to be perfect or had to write things in a certain way because I wanted to get them published. Since this year and doing Amy’s apprenticeship, I feel like I’m writing for me again and that is the best feeling in the whole world. After my reading, I got to sign several copies of the anthology and also meet one of my writing idols, Lindsay Hunter! I cannot begin to thank Burrow Press and Shane Hinton, enough for including me. It was one of my proudest moments. If you have a chance please check out We Can't Help it if We're From Florida--we Floridians are more than just Disney World. Here are a couple more photos from the event. (Me with Lindsay and my dear friends!) Above is a photo of me signing! 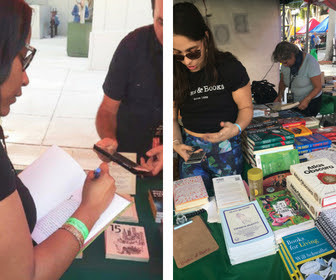 Reading at the Miami Book Fair! Hi, all! Words cannot even begin to express how honored I was to read at the Miami Book Fair! I haven't really posted about it because life has been too crazy as usual, but I had a short essay published in the anthology, We Can't Help it if We're From Florida. 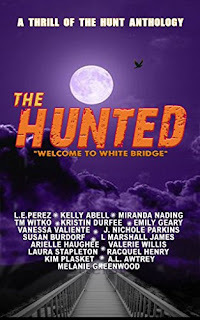 I am alongside some of my favorite writers such as Lindsay Hunter, Sarah Gerard, and Lydia Yuknavitch! 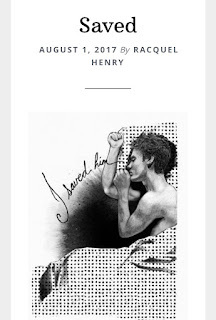 Even cooler: my creative writing professor John Henry Fleming is also in the anthology. It's a wonderful feeling to know that my work was included in the same book as the professor who helped to mold the beginning stages of my writing. Last, the anthology got the official stamp of approval from National Book Award finalist, Lauren Groff! 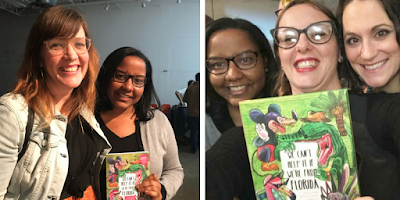 Now that I've gushed about the anthology, it's time to gush about the Miami Book Fair! I was lucky enough to be invited by Burrow Press to read from the anthology. 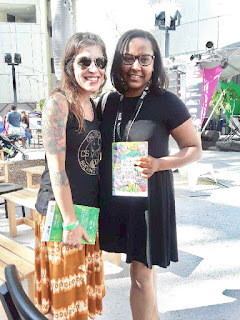 In case you haven't heard of the Miami Book Fair, it is the largest book fair in the United States. So many awesome authors attend each year. This year, one of my favorites, Edwidge Danticat, sat in the audience while I read. Talk about a lot of pressure. The reading went well, and even though my time was short, I'm glad that I had the opportunity. I will forever be grateful. Here I am pictured with my dear friend, Letisia Cruz, who came out to hear me read!